The unexpected is happening. 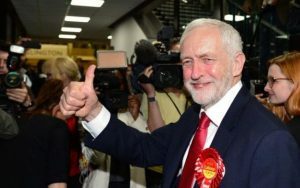 In the wake of the late surge in support for Labour that wiped out Theresa May’s majority (and hit the Liberal Democrat vote), a new poll on 11 June showed Labour six points ahead of the Tories. Labour were also reporting 15,000 new members in the first three days after the 2017 General Election. On the doorsteps on polling day, and with friends since, the sense is that Labour under Corbyn have caught people’s imaginations. What does this imply for Liberal Democrats? My sense is that this is a problem because people’s imaginations have been caught by something unrealistic. If we now had a majority Labour government, disappointment would be around the corner, but for now, hopes are roused. There’s a parallel with Brexit being seen as a bright new future. A sharp illustration is our respective economic policies. The Institute of Fiscal Studies concluded that our manifesto was the only one properly costed and also the most likely to deliver for low income people. If 9 June had seen Vince Cable become Chancellor of the Exchequer, that would have boded better for the economy than either of the other choices. Instead a costly cocktail of promises from Labour has fired people’s imaginations. The air of unreality is particularly sharp around Brexit. This is by far the most important issue the UK faces at the moment, but it barely figured in the election campaign — except in vacuous comments about who could “get the best deal”. Perhaps the most disarmingly-honest canvassing conversations from the referendum campaign were with the people who said they simply didn’t know enough to decide. I am beginning to think that both the Corbyn surge and the Brexit vote are fueled in part by a desire for change. Here’s where the normal Liberal Democrat approach is a little out of step. On autopilot we would be looking for evidence-based policy and for initiatives that are both achievable and consistent with our ideals. Both of those are eminently wise, but fail to connect with people reacting emotionally to a difficult world. Europe has been a secure containment for British politics for so long that the referendum result has put the system into a state of shock: perhaps it isn’t coincidence that Theresa May ends up destroying her own mandate to negotiate just before starting Brexit talks. With things as they are, we too need to offer a vision — one that engages the emotions and is not disconnected from reality. The task is urgent if we are not to become painted as the party of no vision. democratic reform — inclusion needs to move on so that voting reform and devolution happen, giving people real control. The details probably need refinement between now and the printing of that Focus, but the direction has to be to offer a vision and a real future, especially at a time when Labour are horribly unclear on how they propose to handle Brexit.